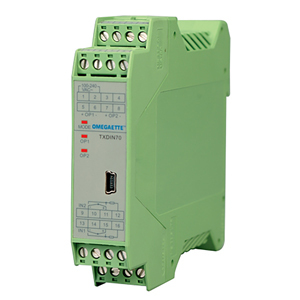 It provides 2 channels of configurable inputs, and supports multiple voltage, RTD, thermocouple inputs with auto reference junction compensation. If parallel connected to an external precise resistance, it accepts current signal input. Each channel has its own digital filtering and can adjust its filtering degree. It generates two isolated current outputs, 4 to 20 or 0 to 20 mA. The range of retransmission output can be freely defined. The model is DIN rail mounted. Its width is only 22.5 mm. The instrument can be easily configured by connecting to our E8 handset display. Universal power supply of 100 to 240 Vac or 24 Vdc. External plug-in display (display is required to program transmitter). Display comes with cable.